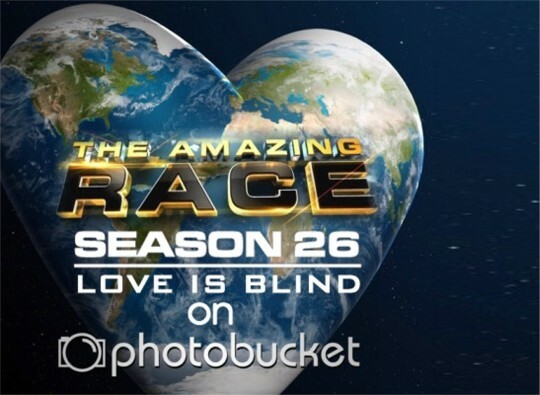 Recap: The Amazing Race 26, Episode 9 – "I'm always right and you never listen." During the Pit Stop at dinner, Matt tells Jelani & Jenny that U-Turning them was all just gameplay. But Jelani & Jenny will be sure to pay them back next chance they get. Teams set off on the 9th Leg as they fly to Amsterdam, the Netherlands. 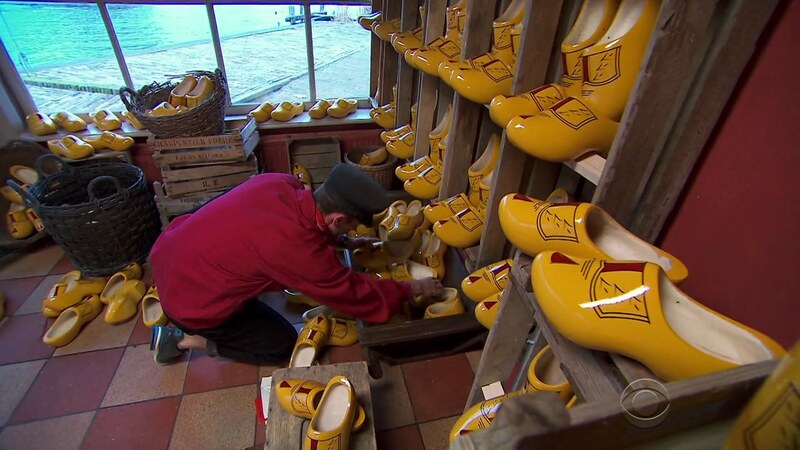 Once there, they hop into taxis to T Jagershuis where they immediately find the Road Block. 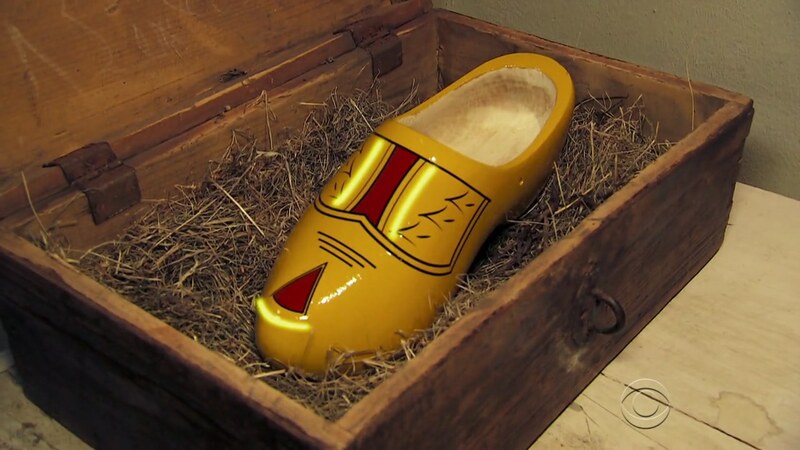 For this Road Block, teams must search through hundreds of intricately designed klompen for one that matches the single klomp in a box. Jenny, Tyler, Matt, Rochelle and Blair do the Road Block. Jenny manages to find the correct one first and they must now ride bikes along the Amstel River, cross it on a ferry and continue on to Munttoren in Amsterdam. 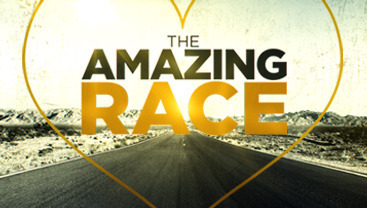 Laura & Tyler, Hayley & Blair and Mike & Rochelle are the next to finish the Road Block, leaving a frantic Matt in last. Jenny & Jelani ask a local for directions and she gives them an easy, direct route. But Laura & Tyler take what was supposed to be the shorter, but more complicated route and they arrive at the cluebox first. And that clue reveals the Detour. 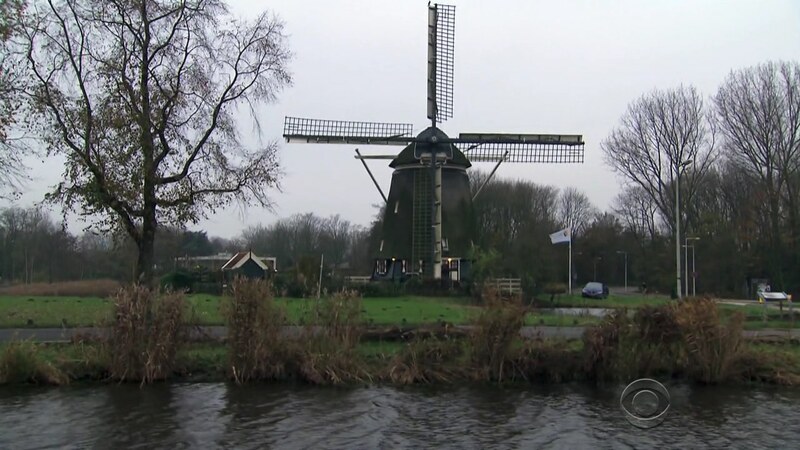 In Soak, teams will ride an electric-powered floating hot tub along the waterways of Amsterdam while looking for three clues along the way. In Shuffle, teams will play the Dutch version of shuffleboard known as sjoelen. Once they score 51 points, they’ll receive the next clue. Tyler & Laura choose Soak and Tyler strips to his underwear to show off his body to the locals. Jenny & Jelani are surprised to see Tyler & Laura already in the river. Hayley & Blair ask a local for directions to where they can hop into the hot tubs. With Hayley in front, Blair tells her to make a turn at the street with an H in the beginning. Hayley points out the street with the H, but Blair says to keep going. They end up going too far, so they turn around. And lo and behold, Hayley was right. Again. They turn at the street she pointed out earlier. While Matt finally finds the correct klomp, Mike & Rochelle arrive at the Shuffle Detour. Laura & Tyler figure out their clues as “Ice Skating Rink” and head back just as Jenny & Jelani are making their way down. 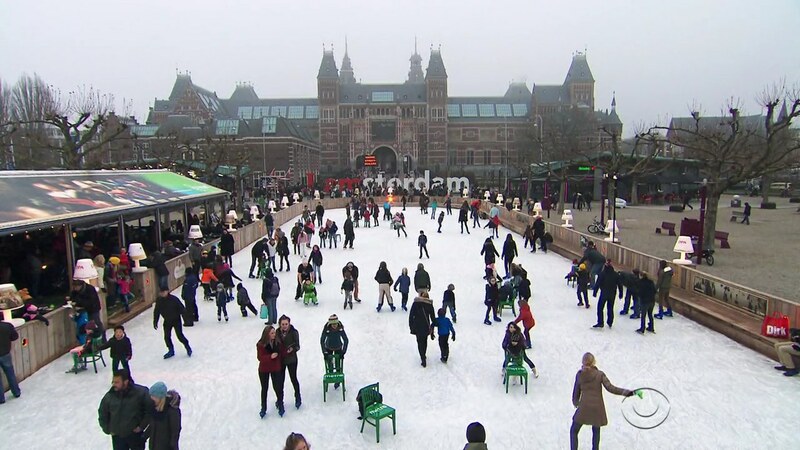 Laura & Tyler give their answer and receive the next clue directing them to the Pit Stop at Museumplein Ice Skating Rink. Laura & Tyler officially claim their 2nd win in a row and win a trip to Seoul, South Korea. Jenny & Jelani see all three clues, but can’t figure out the five “I”s, so they decide to go back down the route again and maybe ask Hayley & Blair what they think the answer is. Hayley & Blair do manage to figure out “Ice Skating Rink” and they head back to the start. They see Jenny & Jelani coming back and they agree not to tell them anything. That allows Hayley & Blair to give their answer and get the next clue. They head to the Pit Stop and officially check-in as Team #2. Over at Shuffle, Mike & Rochelle finally finish on their 11th attempt and they head to the Pit Stop. Matt & Ashley head to the Shuffle Detour and Matt gets 42 points on his first attempt. Ashley needs to get 9, but fails. 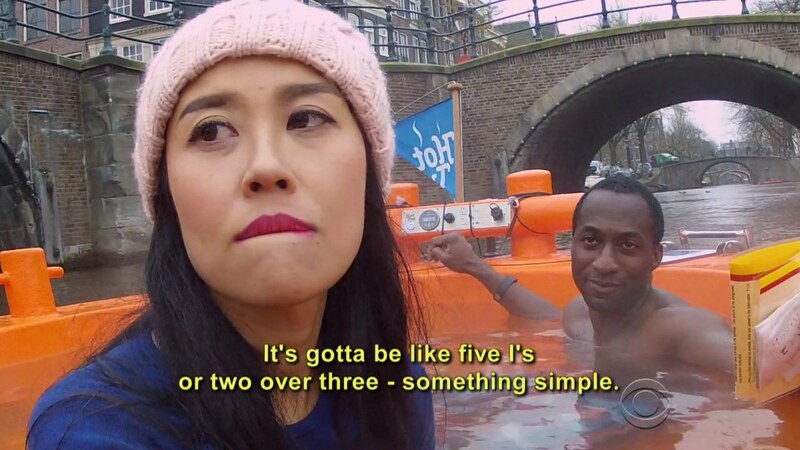 Jenny & Jelani arrive at the start of the hot tub course, but they still don’t know what the five “I”s mean. 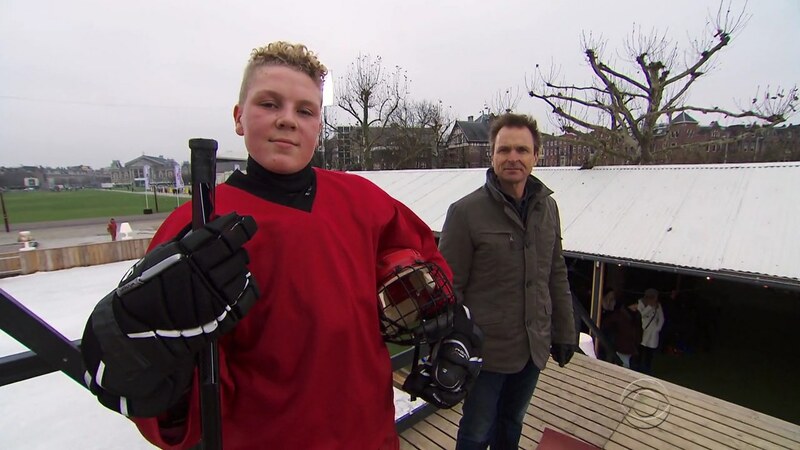 They ask a local about local skating rinks and realize the Is mean “Ice.” They get the next clue. With Mike & Rochelle lost, Jenny & Jelani are able to step on the Mat in 3rd. Mike & Rochelle end up as Team #4. That leaves Matt & Ashley in last, but NOT eliminated since this is a Non-Elimination Leg. So this wasn’t a bad Leg I thought. I like the bike riding the entire Leg. That was definitely something different. And the Leg design made it a good one to have a Non-Elimination on. The Road Block was a typical needle in a haystack task. The Detour was unbalanced though. The hot tub could’ve been a regular Active Route Info task, especially with that riddle. The sjoelen side of the Detour was good on its own. Pretty simple Leg, yet they managed to fill the hour with it, so that’s an accomplishment at least. Overall, not a too bad Leg or episode. Seriously, Hayley & Blair are absolutely hilarious and awesome. You can say that Hayley is annoying, but she really is always right. lol Can you believe that started on the first Leg? Blair not listening to Hayley? And now here we are at Leg 9 and they’ve got a good shot at winning the whole thing. Their dynamic really is one of the few redeeming results of the Blind Date twist. Ouch at Jelani & Jenny not figuring out “Ice” at the Detour. They’re lawyers, right? I guess they really were overthinking it, but in another Leg, that little overthinking could’ve ended the Race for them. Rochelle & Mike are still hanging on. Again, I really hope they can step it up more instead of just falling forward since they, especially Rochelle, have shown they can really do very well. Matt & Ashley were alright this Leg. Matt has shown that he tends to get pretty frantic at times, like last week in Namibia. So that definitely hindered him at the Road Block. Should be interesting to see if they can overcome the Speed Bump since all teams will likely be equalized going to Peru next week. Tyler & Laura are still meh for me. Tyler was horrible at the Detour though. Too much playing up for the camera is never good. ← Recap: Kamen Rider Drive, Episode 26 – Which Path Will Chaser Choose?